First Berkshire Fleet List: 20367 has transferred to First Aberdeen. 41440/1 are confirmed as being on loan from First London. Thanks to Brian Coney for this. Weavaway Travel Fleet List: The two new Iveco / Plaxton Panther 2s arrived on 24th, are YN12 BRZ/ZR with Haywards lettering and will be based at Reading. V130/53 MEV arrived from Ensignbus the same day, as did V109 DCF from Reading, still in Reading Buses livery. Thanks to David Wilder for this. V434/5 DRA have gained Newbury & District branding whilst V130/53 MEV are currently plain black. Thanks to Woodie for this. Reading Transport Optare Solos: Former 105 passed from Blue Iris, Nailsea to Crosville Motor Services, Western-super-Mare on 1 April. Thanks to David Smith for this. Baileys of Newbury Fleet List: New in January was MAN A91 / Beaulas Stergo Spica PO61 KAJ. FM02 KUR and PN05 CNC passed to BASE (dealer) in part exchange for this and PO12 ENT. Thanks to Buses magazine for this. Carousel Buses Fleet List: 802/3 were in service by 26th. Thanks to Peter Coney for this. DMS23 has been sold to North Summerset Coaches, departing on 25th. Thanks to John Hammond for this. Stewarts of Mortimer Fleet List: Three Irizar i6s are on order to replace YN07 EDX, YN07 OOA and BX07 NLJ. Thanks to Bus Fare magazine for this. Stagecoach in Oxfordshire Fleet List: 20933 went into use on training duties a couple of weeks ago, with 20936 to follow shortly. 52251/51 will remain in use until the summer and then be sold. Stagecoach in Warwickshire Fleet List: 47043 has been repainted into fleet livery from Corby Star orange, with 47038 to follow. Thanks to Adam for this. Reading Transport Fleet List: 109 and 115 had been withdrawn by 21st. 111 left the previous week for repaint into Weavaway Newbury & District black with 109/15 being prepared for similar treatment. 804 went on loan to Newbury sometime in March to cover overloading on Vodafone services from the Station to the HQ in the morning peak. Thanks to Brian Coney for this. Reading Transport Scania OmniCity Double Deckers: The seats in 1107 and 1111 have now been re-trimmed with fabric. 1102/4/8/14 and possibly 1109 remain in leather. Thanks to Brian Coney for this. Mortons Travel Fleet List: The new H15 BUS is named Cheryl Marie, as per the previous vehicle with this registration. Reading Transport Fleet List: 152/4/5 entered service on 16th. Thanks to James Cusworth and Geoff for this. 122 left for Weavaway Travel on 25th March. Thanks to David Wilder for this. Dart 610 has been unexpectedly withdrawn as a consequence of the Streetlites entering service, with route 18/28/991 to be operated by one of the Streetlites. 115 was still in serve on 17th, but 109/11/15 are all now presumed withdrawn. Reading Transport Dennis Dart SLFs: 610 was loaned to Weavaway Travel on the afternoon of 28th March until the morning of 30th, running on franchised route 6/6A on 29th. Thanks to David Wilder for this. Reading Transport Optare Excels: Former 964 passed from Three Star Coaches to Express Motors in February. Mortons Travel Fleet List: New additions are an articulated Volvo B10M / VanHool Alizée from Ulsterbus (ex DAZ 3001) via Mike Nash (dealer) in March which has taken the registration H15 BUS, Leyland Olympian H654 VVV which had joined the fleet by December 2011 and a Ford Transit Connect service van LV54 DWE. It is not yet known what has happened to the vehicle previously holding the registration H15 BUS. P11 KGF is confirmed to be in dark green like the others. Weavaway Travel Fleet List: New additions in the course of preparation are Dennis Trident / East Lancs Lolyne V434/5 DRA from Nottingham and Dennis Trident / Alexander ALX400 V130/53 MEV from Stagecoach London. YN08 NTO left for Plaxton (dealer) on 4th and YN57 EZG around 13th. Two new Iveco / Plaxton Panthers are due imminently as replacements. Thanks to David Wilder for this. Stagecoach in Warwickshire Fleet List: 16516 has a new MegaRear for Heritage Property. Rugby reserve 16677/80 are in store at Leamington. Thanks to Keith Wood for this. 47042 has been repainted into corporate livery from ex Corby Star orange. Thanks to Simon Langley for this. 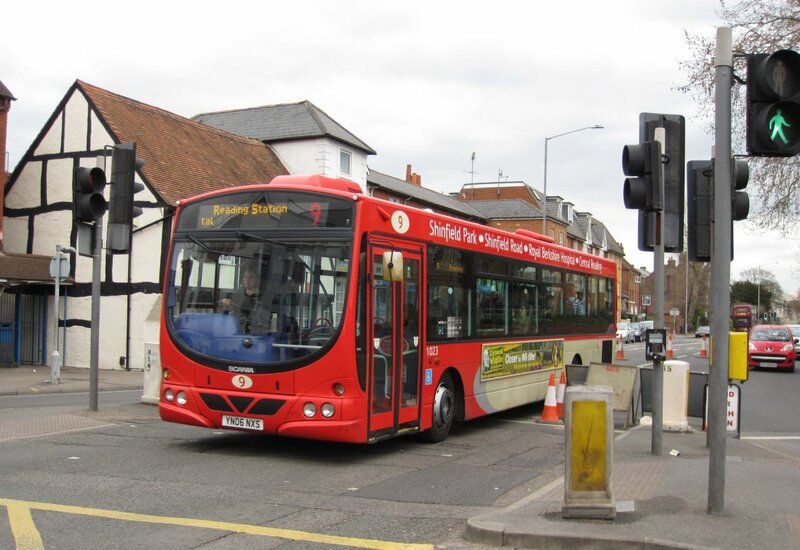 Reading Transport Fleet List: 153 entered service on route 29 today. Reading Transport MegaRears: The rears on 860 and 861 appear to have space for different offers to be displayed within the same advert - 860s offer had changed from the original red Nissan to a blue Peugeot by the end of March. 861 had a silver Mazda originally. Carousel Buses Fleet List: Loaned Wilts & Dorset Optare Tempo YJ06 FXW has been permanently acquired and repainted into Carousel red numbered 801. Further examples YJ56 WUB/D are due shortly. Thanks to John Hammond for this. 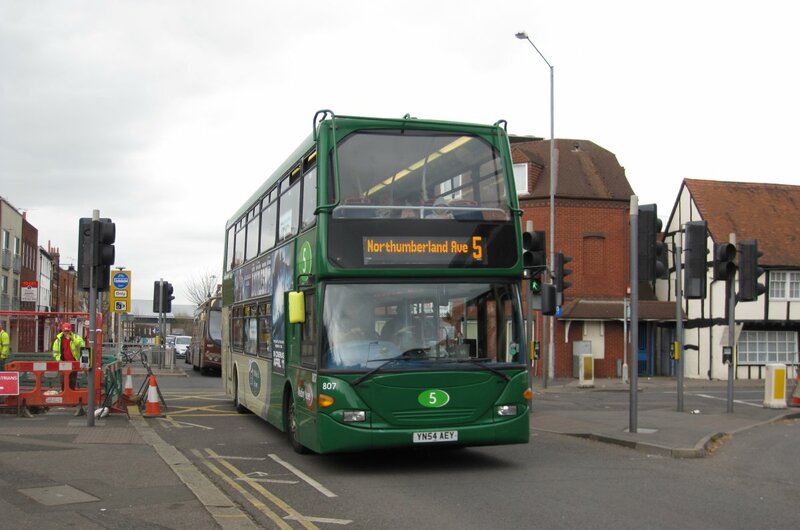 Fleet Buzz Fleet List: 25246-9 gained 'Buzz into Town' branding for routes 72/82 over the weekend prior to 2nd April. Thanks to Martin for this. 46618 and 49616/7 have been withdrawn for disposal. Oxford Bus Company Fleet List: 909 was sold to PC Coaches, Lincoln in January. The Go Ahead group website reports that the 19 new hybrids are to be Volvo B5LH / Wright Eclipse Geminis rather than ADL Enviro 400Hs. 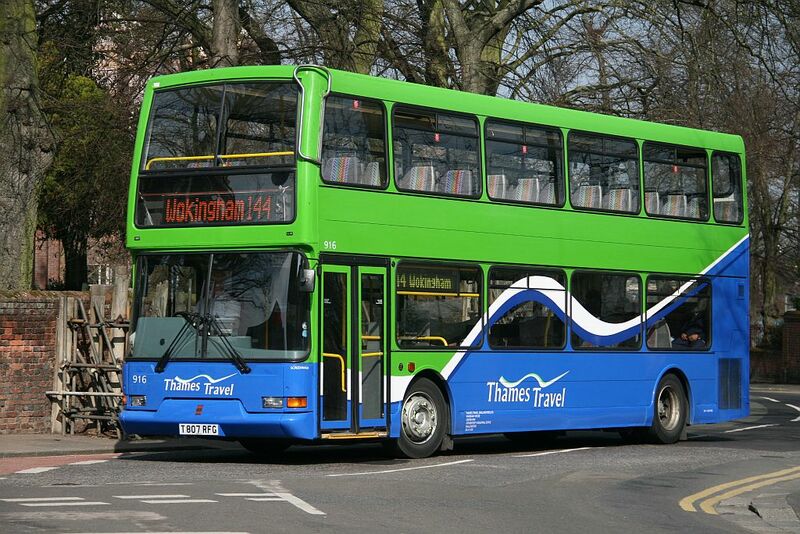 Thames Travel: New photo of 916 added. Thanks to Peter Coney for this. Stagecoach in Warwickshire Fleet List: Stratford 16489 has been withdrawn with Leamington 16599 transferred from reserve to Stratford in its place. Leamington 20224 has gone into reserve with 33352 returned to service. Rugby 47039 has returned to service following repairs. Training vehicle 52358 has been withdrawn for disposal, being replaced by 52526 from reserve (Megabus). Ancillary 91857 has been replaced by 91872. 93296 was added in October. Reading Transport Fleet List: The branding on 111 has been altered from '£1 Shuttle' to 'Shuttle' following the minor fares changes from 26th. 122 has been withdrawn and repainted black pending sale to Weavaway. 109/11/15 will be similarly treated once the Streetlites enter service. Thanks to Brian Coney for this. The branding on Bronze 1006 and 1027 has also been amended from '£1 to town' to '£1.20 maximum fare'. Carousel Buses Fleet List: The fleet has been renumbered into the Oxford Bus Company sequence. Optare Tempo YJ06 FXW is on demonstration from Go South Coast. Thanks to John Hammond for this. DM8 appears not departed the fleet as previously reported, but is still pending imminent disposal, whilst DM6 and withdrawn DMS14 are unaccounted for. H125 THE appears to have left the fleet some time ago. First Berkshire Fleet List: 41441 is in service at Slough from London in plain red livery. Thanks to David Fuller for this. 41440 is also at Slough in First London livery, both this and 41441 are thought to be on loan. Thanks to Brian Coney for this.